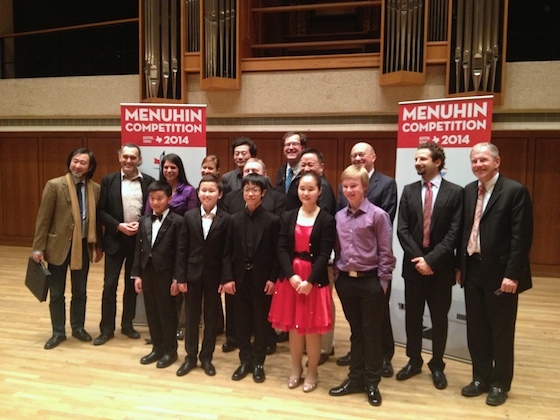 AUSTIN, Texas — The Junior Division Laureates for the Menuhin Competition were announced Friday night in Austin after an afternoon of semi-final rounds, followed by an evening concert that featured each finalist playing a showpiece with the University of Texas Orchestra at Bates Recital Hall at the Butler School in Austin. Juror Pamela Frank told the finalists, "I think this week was one of the most thrilling weeks of my life; I'm reminded how lucky we are to be musicians. You spoiled us rotten, you violinists! I was listening to you on the highest level; then I was reminded how beautiful it is to play with such abandon and innocence, and I would urge you to keep that. Keep doing what you're doing."